Mottled shades of dark teal and muted turquoise make this bag a symbol of calmness, open communication, and compassion. As a blend of green and blue, teal is a color that promotes engagement on a personal level. The blue tones also promote serenity, while the green tones promote healing. 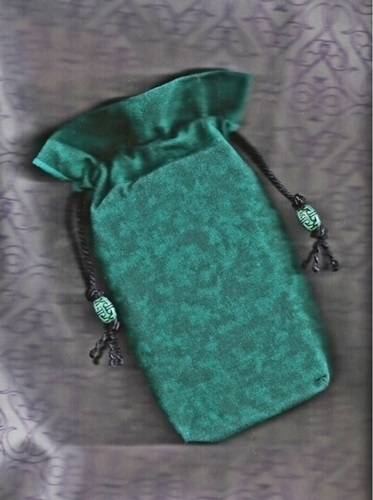 This Compassion Tarot Bag is the perfect choice if you're a reader who sees yourself as a healer or counselor. Features: Our popular and elegant Double Draw Bag design features squared off (gusseted) bottom corners to better fit a deck of cards, rolled hem finishing on all edges and seams, and a reinforced double drawstring closure that creates a 1" ruffle effect.